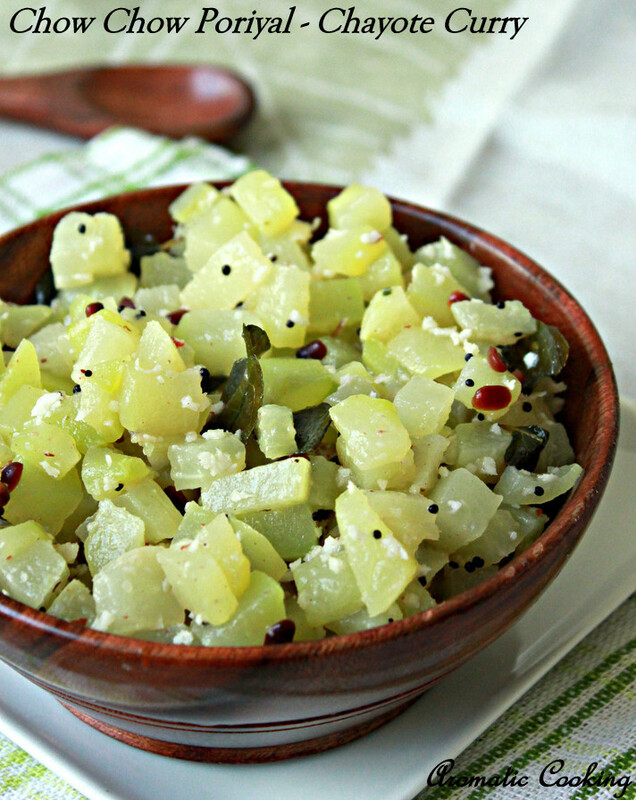 Chow Chow or Chayote is a pear like light green vegetable, very commonly used in South Indian cooking. It's a native of Mexico (Wikipedia says so) and I think it's also used in other Asian cuisines, since I used to find them in the Chinese and Korean grocery stores, back in the US. Today's poriyal is a very simple one. Mostly this vegetable is used in sambars and kootus, but very rarely seen as a poriyal. I started making this, only by chance, had nothing else in the refrigerator except for a couple of chayotes, so tried it out this way, it tastes really good and gets done in no time. This poriyal goes very well both as a side dish to rice and dal and with rotis too. In fact, I like this vegetable, cooked as this poriyal, than in a kootu..
Heat some oil, add the mustard seeds and the urad dal, when it starts spluttering, add the red chilli, asafoetida and the curry leaves. Mix and immediately add the chopped chayote, salt and about 2 tablespoons of water. Mix, cover and cook on medium heat till cooked and the vegetable is soft. Add the coconut, mix and remove. Don't over cook the vegetable, it can turn too soft and mushy. Also once the vegetable is cooked, if there is still some water, raise the flame, let the moisture evaporate before adding the coconut, you want the curry to be dry. Chayote is available in all Indian, Chinese or even in some American super markets. looks soo simple n yummy.. This is one thing which I always love to do with rotis. Nice! 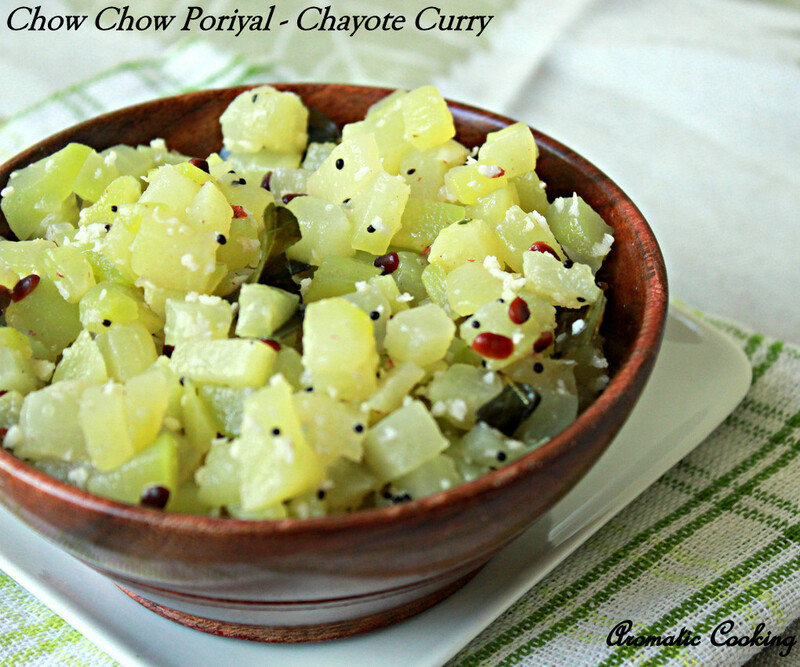 Excellent and delicious poriyal,prefect side dish. I love this vegetable and like this simple and delicious recipe of yours! Looks delicious and healthy curry. Participate & win e gift vouchers in Flavors Of Cuisines-"Chinese"
my fav veggie :) like your version..
my one of favorite vegetable... yummy!!! just a simple vegetable salad with sayote... hmnmmm... yummy!! !